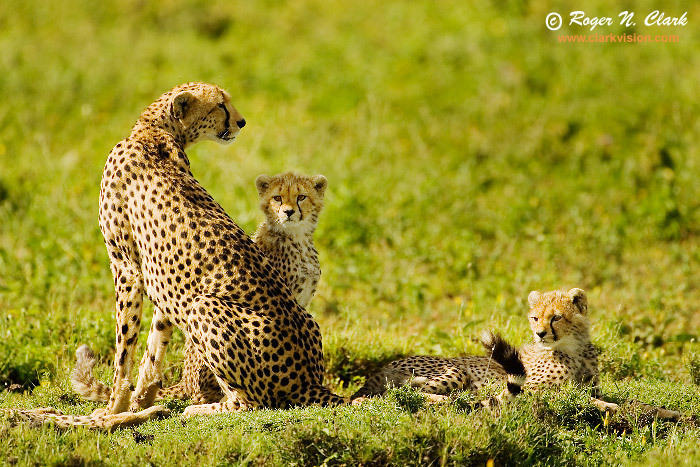 This is a mother cheetah (duma in Swahili) was trying to find an opportunity for some prey in the great migration on the Serengeti in Tanzania, Africa, but the cheetah cubs just wanted to play. A little while later, the mother went after some gazelles, but the gazelles ran when they saw the cubs trying to imitate mom and were not hidden well enough. Technical: Canon 1D Mark II 8-megapixel camera, Canon 500 mm f/4 L IS lens plus a 1.4x teleconverter giving 700 mm at f/5.6. Exposure: 1/1000 second at ISO 200.